In her many years in ministry, Sister Mary Teresa LaBrake (Sister Maria Goretti) has served as a dynamic and comforting spiritual presence to people whose paths crossed hers in her home town of Ogdensburg, New York. 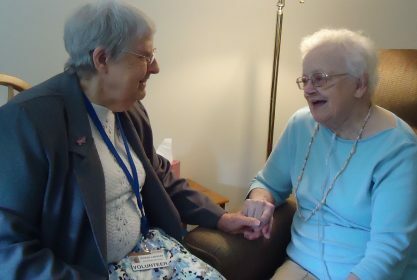 Now, in her retirement years, she brings the light of her faith and the comfort of her compassion to the residents of the skilled nursing care unit in her retirement home in Philadelphia. “Some of those I visit ask: ‘Why hasn’t God taken me, why am I still here?’ I reassure them that God loves them, that they are special and that there is purpose in their existence. I encourage them to be pleasant with others, to speak kindly and be courteous. In that way, they are showing God to others. They listen and I believe they are comforted. I am proud to call Sister Mary Teresa LaBrake my cousin. From the time I was a little child, she was looked up to with awe…. Now I see her continuing in her retirement years to encourage and comfort others…. She is a wonderful, compassionate person and it is obvious she loves doing God’s work where ever she is. She is a wonderful example of her Order of The Grey Nuns of the Sacred Heart. May she continue her work as she shows others the way…..